On the list of Chicago's longest-running holiday shows, Hellcab (originally titled Hellcab Does Christmas) falls fifteen years behind the Goodman's Christmas Carol, but a few years ahead of The Christmas Schooner. What distinguishes Hellcab from its seasonal compatriots, however, is its setting. Instead of Victorian London, or a turn-of-the-century Michigan logging community, Will Kern's play looks at our own city through the eyes of a humble taxi driver who witnesses the best and worst of humanity on a Christmas Eve as he goes about his duties. Nobody knows just how many actors put their individual stamp on this role during its nearly decade-long initial run spanning three different theaters, but when Profiles Theatre proposed reviving the play in 2012, their second production featured Paul Dillon from the premiere performance, while this year marks the return of Richard Cotovsky taking over the wheel. In the original staging, our unnamed driver's thirty-four passengers were portrayed by an ensemble of six actors trading off roles in swift succession, but for the Profiles staging, director Eric Burgher decided that every character should be played by a different actor, many of them appearing onstage for less than 90 seconds. "My first run with Hellcab was almost a year and half in duration. In that time, I worked with many different actors," Cotovsky shrugs, "but it was still a little strange coming to it this time, with so many people that I never met before. Also, the first time around, we had three run-throughs and after that, I was on my own, while this time we rehearsed it for a full four weeks, exploring and analyzing the cab driver's character. As with any remount, you remember the speeches as you did them before, so the process was helpful in making me approach the text differently." The dialogue indicates in places that the cab driver is a relatively young man. (The author claims to have envisioned him to be about thirty-five.) Cotovsky recalls Kern expressing concern about him playing the role at the age of nearly sixty, but he feels that the cabbie's protective attitude toward young women in several scenes can now be attributed to unselfish motives, and his refusal of a flirtatious matron's request to be called "Sugar Mama" after he declares her "not old enough to be my mother" becomes a gallant gesture. The audience continues to respond to the familiar geographical references, he reports, while acknowledging that that many of the landmarks identified in Kern's script (the Pillar of Fire church in West Lakeview, for example, or the Wooden Nickel bar on Wilson Avenue) are now lost to memory. "The audience doesn't necessarily react to specific addresses any more, but you can hear the reaction when the cab's called to the south side or the driver picks up some shady characters." Cotovsky was recently awarded the Joseph Jefferson Lifetime Achievement award for his founding of the Mary-Arrchie Theatre Company more than thirty years ago, where he continues as its artistic director. What made him decide to return to the stresses of acting rather than enjoy the benefits of regular hours? "Mike Nussbaum—now ninety years old and still working—was who inspired me to start acting when I saw him in American Buffalo at the St. Nicholas Theater in 1976," Cototvsky admits, "For so long, my administrative duties kept me from doing the things I love to do, but I have every intention of continuing to act and direct. I'm a long way from retirement." 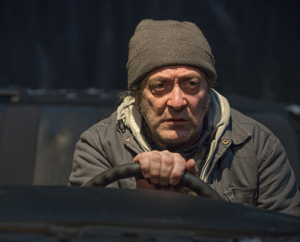 Hellcab runs at Profiles Theatre through January 4.